If you are looking to repair laptop screen technician in Caloundra on the Sunshine Coast, then Tech Aid is a great place to get the issue resolved. Not everyone realises that many laptop faults can be fixed at a reasonable cost, without having to throw it away and buy a new one. If your Laptop is running slow, has a virus or won’t start, or you’ve got a cracked screen, contact us now to get it fixed promptly. Also known as LCD Replacement in older laptops or LED Replacement in the newer models. Macbook screen repairs are for Mac’s that are out of warranty! 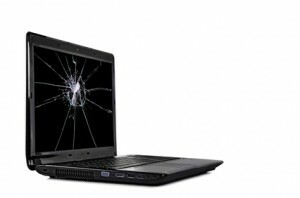 Screen damage is usually as a result of either fall damage or being dropped, Sometimes as a result of being stood on, or closing the lid while a mouse is sitting on keyboard. If you have had one of these accidents, don’t worry, you shouldn’t have lost any data, documents or pictures. Although data loss and corruption can happen, especially if the laptop is powered-on when it’s dropped causing damage to the internal hard drive. Using the laptop on your lap – this can cause overheating, or accidental drop. Leaving it on the floor – kids don’t tend to realize that standing on it is a bad idea (personal experience). Leaving your mouse sitting on the keyboard – someone may close it on you, causing the screen to crack. From removing a virus to replacing the power socket in your laptop, you will find Tech Aid offers a wide range of services to meet and complete your IT needs! We are located in Moffat Beach and our service area is mainly in the 4551 postcode, however we also service businesses north as far as Yandina.Do you live in the following suburbs? We cover Caloundra, Moffat Beach, Currimundi, Dicky Beach, Shelly Beach, Battery Hill, Golden Beach, and even Pelican Waters!